It is difficult to keep documentation in sync with source code. One of the reasons is that documentation and source code are stored in separate files that usually also require different editors to edit them. ROBODoc solves this problem. Specially formatted documentation headers are extracted from source files and stored in a different file. ROBODoc can reformat the documentation in HTML, XML DocBook, TROFF, ASCII, LaTeX or RTF format. Indirectly you can convert to pdf and windows help format. This way ROBODoc allows you to include your documentation in the source code. You can edit the source code as well as the documentation in a single file with your favourite editor. This makes it easier to keep your documentation in sync with your source code. ROBODoc can be used to document functions, methods, classes, variables, makefile entries, system tests, and anything else you can think of. 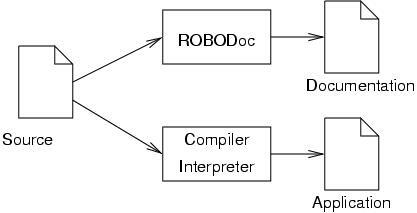 ROBODoc works with C, C++, Fortran, Perl, shell scripts, Assembler, DCL, DB/C, Tcl/Tk, Forth, Lisp, COBOL, Occam, Basic, HTML, Clarion, and any other language that supports remarks.